Through most societies of the human past, children comprised half the community. Archaeologists and their collaborators are now uncovering many aspects of the young in societies of the deep past, too long the ‘hidden half’ of prehistory. In coastal mud at Happisburgh in England, footprints of ancient Homo dating from 800,000 years ago include those of a child just 3ft, 3in high. In the caves of Upper Palaeolithic France, more footprints show adult cave painters were accompanied by children. Ochre markings around the outstretched hand of a patient child held against a rock wall are permanent graffiti that have lasted 20,000 years, and the fingers of two-year-old children daubed paint on walls suggest them sitting on an adult’s shoulders. In the rock engravings of the Mojave Desert in Nevada we see two adults walking with their two children, and in paintings of Southern Africa, young children walk alongside women we assume to be their mothers. Children in every time and place start to learn the core crafts they will need as adults, typically by watching and copying. Evidence of learning may be hard to identify, though weaving equipment was found in Bronze Age and Iron Age burials of children in Italy. But if the apprentice’s metalwork is melted down for re-use, or the unskilled pots remain unfired, archaeologists will not find them. In the Trans-Urals of Russia, fingerprints from children aged five to eight were found on rough Bronze Age pots of the second millennium BC buried with children; were they made by the deceased child, or provided for burial by the child’s age-mates? In the Trans-Urals of Russia, fingerprints from children aged five to eight were found on rough Bronze Age pots of the second millennium BC buried with children; were they made by the deceased child, or provided for burial by the child’s age-mates? Stone tools last forever. Both learners and experts produce plenty of waste flakes before the final tool emerges. We may find the unskilled apprentice if we look for a concentrated area of poorer quality knapping which implies an area for learning and practice. Increasing numbers of such sites have been identified, from Sweden to Ireland, from the US Great Basin in Nevada to Hokkaido in Japan, and dating from Neanderthal times onwards. Play, of course, helps practical skills develop. We do find objects which appear more like a modern child’s plaything. But is that what they are? Is a human figure a child’s doll or – to use the archaeological cliché – a ‘ritual object’? The little clay animal figures from Lizard Man village in Arizona look like toys; an Iron Age rattle in the form of a small animal from Iron Age Czech Republic could be the same. Miniature furniture found at the Neolithic site of Ovčarovo in Bulgaria ‘feels’ like a doll’s house, as does the clay model house with small animals from the Greek Neolithic site of Platia Magoula Zarkou, but we cannot be sure. The playthings made by children for themselves may not always survive. It seems likely, too, that we sometimes fail to recognise the activities and products of childhood in what appears as a random scatter. Until recently it was nearly inevitable that only some of those born into a family would survive into adulthood. 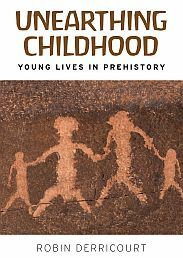 Most of our information on children in prehistory comes from those who died young. We have children’s bodies from as far back as the African Australopithecines. Deliberate burials by Neanderthals include those of children. In prehistory, the youngest infants may have received no formal burial, and infanticide is acknowledged as a feature of many past societies. But some prehistoric societies buried older children using the same ritual and location as for adults, some buried children separately, while others placed their remains beside the dwelling, like those below house floors at sites in Cyprus and Turkey. The style and content of a child’s burial reflect the culture of their society but also the wealth and status of their family. Grave goods can range from a simple pot with food to a collection of household items, or to lavish body decoration. An Upper Palaeolithic child aged two to four years at La Madeleine in France wore clothing embroidered with 1,000 beads; two older children at Sunghir in Russia had ivory carvings, spears and 10,000 beads. Children of prehistoric foragers in Argentina had up to 1,000 beads. The style and content of a child’s burial reflect the culture of their society but also the wealth and status of their family. Grave goods can range from a simple pot with food to a collection of household items, or to lavish body decoration. The fabrics of children’s clothing (skins, or later fabrics) may survive. The skulls may show head binding as in the Tiwanika culture of the Andes, or the accidental head deformation arising from the use of cradleboards in North America. The skeleton itself can show signs of trauma, whether fatal or showing survival suggesting community care, and including the impact of war. There was little discrimination by age or gender in the weapon marks on bodies of fifty-eight adults and children massacred at a 12,000-year-old site of advanced foragers at Jebel Sahaba in Sudan. The fourteenth-century massacre site of Crow Creek in South Dakota included 144 children. Bioarchaeological studies can examine skeletal remains for signs of childhood disease, trace childhood diet and weaning age, and even migration: burials found near England’s Stonehenge indicated a childhood far away in Wales, Scotland or even further. Time-travelling archaeologists visiting a forager camp or farming village would first encounter the noise of children. Their voices have been relatively silent in archaeological narratives but now that has begun to change. Featured image credit: A Neanderthal family scene: reconstruction at Krapina Neanderthal Museum, Croatia by Tromber. CC BY-SA 4.0 via Wikimedia Commons. Robin Derricourt is Honorary Associate Professor in the School of Humanities, University of New South Wales. He is the author of Unearthing childhood.